It’s officially fall! The weather in MD has been absolutely beautiful, and I’ve already been doing my best to jump start fall activities: apple picking, a corn maze, a bonfire, pumpkin spice lattes, and walks in this gorgeous fall weather. It’s also time to think about making some of my favorite fall recipes. 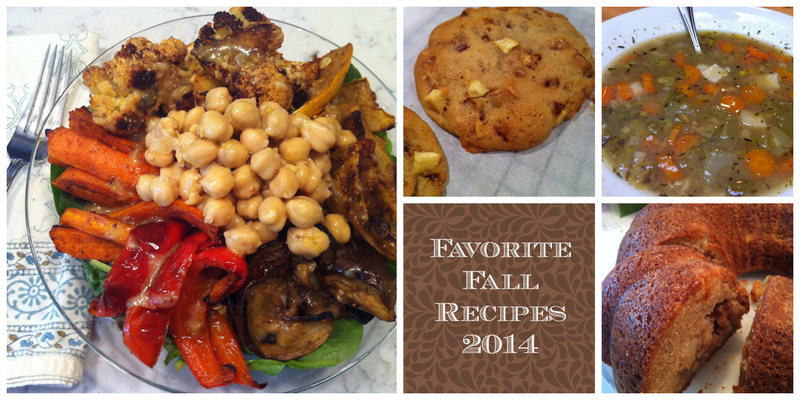 Check out last year’s round-up for even more fall deliciousness. This season start off with some Apple Pie Baked Oatmeal, or some Cobbler Granola Bars. Fill the house with warm, delicious fall smells with this Fresh Apple Bundt Cake, or Fall Harvest Cookies, or Caramel Apple Cookies, or Cinnamon Walnut Baked Apples. Warm up on these cool fall nights with a bowl of soup, like Roasted Carrot Soup, Lentil-Barley Soup, or Curried Ginger Red Lentil and Quinoa Soup. Entrees like Grilled Middle Eastern Spice Chicken, Asian Marinated Flank Steak, Mini Ham and Cheese Quinoa Cups, or Blue Cheese Chicken Salad with Grapes will satisfy and energize you. Make one of these satisfying salads to get your vegetables in this season, Tofu, Mushroom, Green Bean, and Grain Salad, Moroccan Roasted Vegetable Salad, Cabbage Slaw with Tangy Mustard, Asian Cabbage and Kale Slaw. Whatever you do and whatever you make, I hope you have a wonderful fall!